With as many as one in every seven American households being reported as food insecure and one in four children living in food insecure homes, the fact that we waste so much food on a daily basis is concerning. Charity Sub reports that 96 billion pounds of food are thrown away each year by restaurants, retailers, farmers, and individual households. 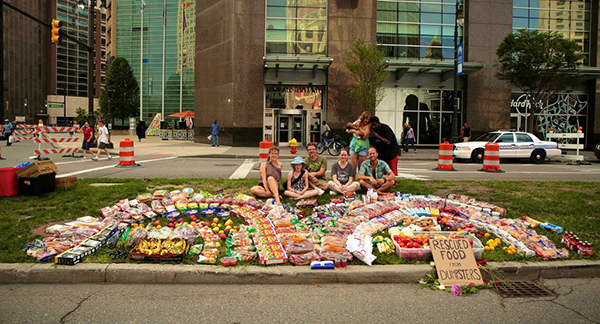 In each major city that he visited on his ride, Greenfield created a demonstration with food collected from local dumpsters. He states that in a single night, he can collect from dumpsters enough food to feed hundreds of people in any given city. Two hours of dumpster diving in Detroit yielded this. More images like this by Greenfield here. 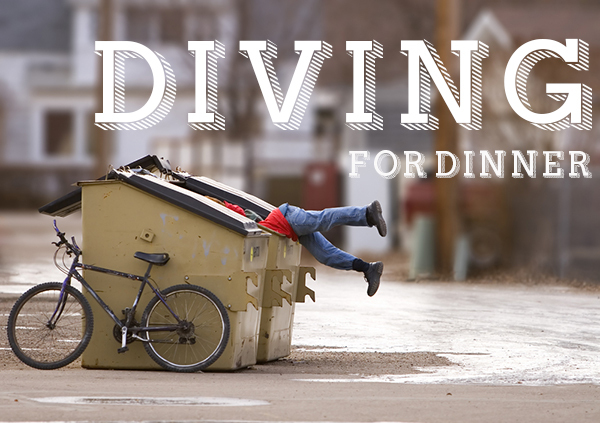 Rob wants you to join his awareness campaign by taking pictures of dumpsters with food inside and post to social media with #DonateNotDump, preferably directed at the grocery or restaurant wasting the food. I would guess that Rob would like to see groceries and restaurants donate food past its sell by date to stores like The Daily Table, to food pantries, or homeless shelters. Any of these are better than throwing away edible food items. While no one wants to give rotten or moldy food away, most of the time the food that is found is dumpsters is not yet expired, it simply cannot be sold in stores. There is a big difference between rotten and expired and the sell by date. Would you eat food that is not yet expired but past its sell by date? Would you purchase (at a discounted price) food past its sell by date that is not yet expired? What would you like to see stores and restaurants do with these food items rather than tossing them in a dumpster?